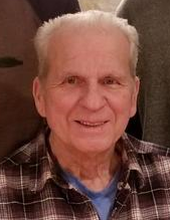 James R. Charapata, 80, passed away unexpectedly at home on Feb. 9, 2019. Born Nov. 1, 1938 he was the son of the late Cecelia (Hylok) and Joseph Charapata being the youngest of 16 children. He graduated from Coleman High School in 1957 where he excelled in basketball. James joined the Wisconsin Army National Guard in Oconto at the age of 17, Company B 2nd Battalion Mechanized 127th Infantry, 32nd Infantry Brigade. This became his lifetime career of 42 years. He married the love of his life, Cynthia Burg, on Sept. 7, 1963. They shared 55 years together, having 4 children, Nick and Kelly Charapata, Theresa and Mark Fuerst, Dale and Angel Charapata, and Lisa and Ryan Walters. He enjoyed spending his time with his 9 grandchildren Alexa and Zach, James, Briannia and Alex, Donnie, Michael, Alyssa, Corinne, Owen and Joe and one great-granddaughter Rylee. He enjoyed playing softball with the National Guard team, playing cards, cutting and splitting all the wood he cut down, reading, watching all the old westerns on TV, picking mushrooms every fall and spending all his time with his faithful dog Lily. He loved deer hunting and watching the Packers on TV and all the sports his grandchildren played. He is survived by his wife Cynthia and his children, grandchildren and great grandchild, sisters, Dorothy Faila, Barbara Bellart and Carol Caruso and many nieces and nephews. He was preceded in death by 7 sisters, Helen, Pauline, Rose, Betty, Irene, Cecelia, and Mary, 5 brothers, Anthony, Peter, Joseph, Paul and Frank. The family will greet relatives and friends at St. Maximilian Kolbe Catholic Church, 6051 Noble Street, Sobieski, WI 54171 Saturday, Feb. 16, 2019 from 9 AM until the time of the Mass of Christian Burial at 12 PM with Father Antonio de los Santos officiating. James will be placed to rest at St. John Cantius Cemetery where Military Honors will be given. Please visit RhodesCharapata.com to express online condolences. To send flowers or a remembrance gift to the family of James R. Charapata, please visit our Tribute Store. "Email Address" would like to share the life celebration of James R. Charapata. Click on the "link" to go to share a favorite memory or leave a condolence message for the family.